1-3 hours of your time. How long will StumbleUpon keep showing your page to its users? This is a rather lengthy read. Grap this post as PDF to read later. 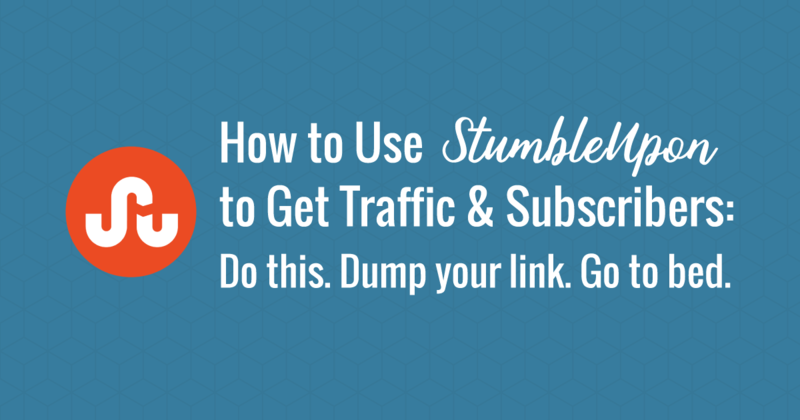 Have you heard stories of people just “dumping” a link on StumbleUpon and getting tons of traffic? I didn’t believe them either. Till that one day when I heard about it one time too often and decided to finally try it out. So, on a yet another Tuesday when I was about to call it a day, I submitted a link to my website checklist to my newly created StumbleUpon account, closed the lid of my laptop and went to bed. 6 hours later, I woke up to 200+ views on a page that would usually get 10 views a day max. I open my stats and discovered that all those views came from StumbleUpon. Long story short, I was able to keep the momentum for 3 weeks that brought me 5K views and 80+ subscribers. Hello, free traffic and new subscribers! In this article, I’ll share with you the 5 steps you can follow to replicate this. But before we start, we need to look into one more thing: StumbleUpon users – your target audience in this case, and how they view content. This is a rather lengthy read. StumbleUpon is a bookmarklet site. Meaning you won’t see any personal thoughts or messages shared together with the submitted articles. People are just publically bookmarking the articles they liked, and that’s the end of it. or, like you and I, wanted to promote their own blog and “stumbled” the article totally on purpose. or whether a lot of people still keep “liking” this article. If you think “What’s the fun in looking at random articles?”, it’s probably the thrill and anticipation of the Unknown. And as you’ll also stumble upon great content that got thousands of likes, it’s a fun activity if you have some free time. But you and I don’t have free time, so let’s move on. As most of the people don’t actively choose to look at it, they have zero motivation to stay on your page. Meaning your headline and the opening paragraphs are crucial for convincing the StumbleUpon user to give your content a chance. For StumbleUpon to keep showing your page to its users (and for you to keep the traffic to it), the StumbleUpon users need to keep “liking” it. So your key to success is to have a page where it’s clear from the first sentence that it’s ultra-helpful unique content. If your page is meh or just “good”, this isn’t going to work. A side note: Regardless of StumbleUpon, if you want your content or lead magnet to get you leads, there is no way around it: It has to be exceptional. But ok, let’s say your lead magnets blows the socks off your website visitors. Step #1: Optimize your page for StumbleUpon users in advance. Because of this whole “I didn’t ask for this article” situation, your visitors will be even less motivated to look at your content as usual. That’s why every word and image count. Make sure your headline communicates the benefit of reading your article clearly. Don’t be clever. Be clear. Tell people what to expect from your page right away and get to the point early on the page (consider cutting the storytelling). Provide a clear, compelling and visually prominent call to action as early as the benefit of your lead magnet becomes obvious. Make your page scannable and easy to process by sticking to the formatting best practices. Do your best but don’t agonize over it. You’ll have a chance to improve things after you submit your page to StumbleUpon and see your visitors interact with the page. If you don’t have a StumbleUpon account yet (I didn’t have one) sign up. You don’t have to interact with anyone or post anything, or have any followers. It could be your first share on StumbleUpon ever (as it was in my case). This is the key to your long-term success: You need to see how your users interact with the page to be able to optimize it on the fly and to win more subscribers and likes. Heatmaps will show you how far your visitors scroll and where they click. Session recordings will show you a video of how a user interacted with the page in that particular session as if you were looking over their shoulder while they were browsing your website. These tools are very easy to install. All you need to do is to copy-paste a piece of code they give you into your website’s header. See if you need to tell your software to start recording a heatmap for the page you are going to submit to StumbleUpon (it doesn’t always do it automatically). Go to Heatmaps -> Create Heatmap to (you won’t believe it!) create a heatmap in HotJar. While you are at it (and while your trial is active), also create a heat map for other pages that get some traffic to optimize them (this has nothing to do with StumbleUpon, but why not kill a couple of birds with this one stone). Step #4: Submit your page to StumbleUpon. It’s show time. Let’s submit your page to StumbleUpon. Specify one interest under which you’d like to submit this page. Start typing, and StumbleUpon will autosuggest stuff. Regarding the tags: Weird story. It’s unclear what’s the best way to do it. While submitting your post, you can specify as many tags as you like, and call them whatever you like. But StumbleUpon neither autosuggests the tags nor displays them for the already submitted articles. Totally weird. Here’s an “unofficial snapshot” of all the interests and popular tags as of March 2014 (I couldn’t find any fresh data, unfortunately). 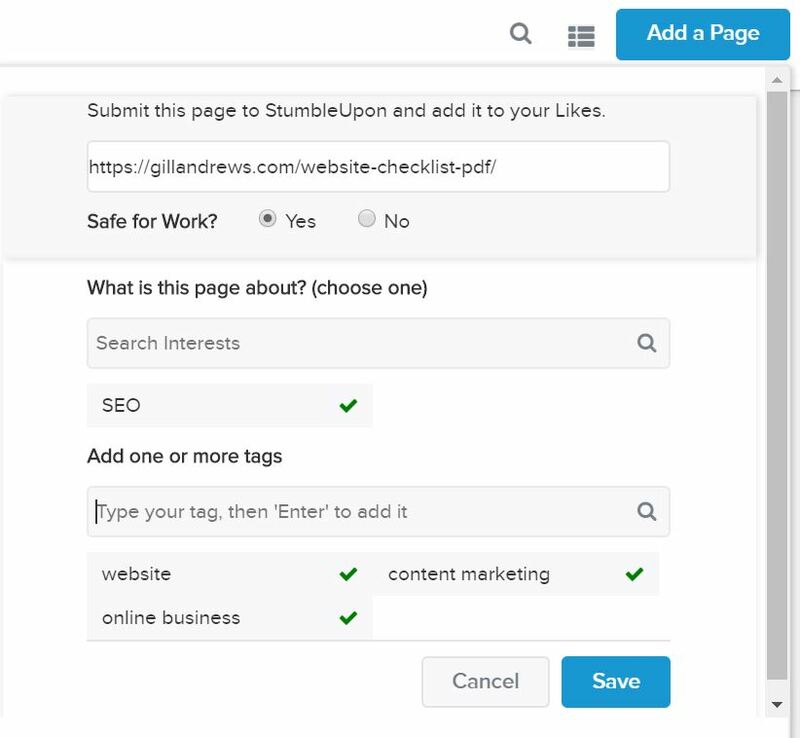 After you submit your page, StumbleUpon will show it to roughly 50 users whose interests match the interest (and I’m assuming the tags) of the page you submitted. 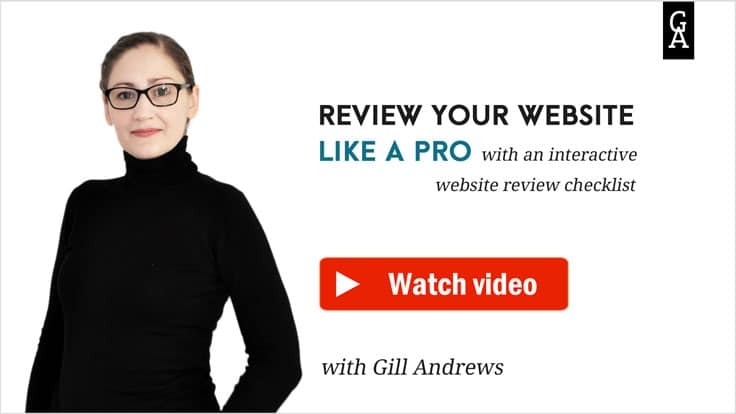 To get the initial 50 views and a chance to build momentum it’s important that your page has been never submitted to StumbleUpon before under that particular URL. To double-check, submit your page and immediately check the number of likes on it. If it’s larger than 1, it means someone has already “stumbled” it, and you are not going to get this initial boost of 50 views. Duplicate the page under a different URL (for example, yourwebsite.com/my-page-2) but set it to “noindex” to tell Google not to index it (otherwise you’ll have a problem with duplicate content). Submit the page under the new URL. or keep showing it while people are still “liking” it. Oh wow, you are still reading! If you need a break, grab this post as PDF to read later. While I was getting the traffic from StumbleUpon to my page, I was keeping an eye on the number of views from one side, and the number of likes it got on StumbleUpon. I noticed that it was still getting 100+ visits a day while the likes-to-views ratio was around 10,5%. I stopped getting traffic from StumbleUpon when the likes-to-views ratio dropped to 10,1% (yes, I was literally measuring this a couple of times a day; and yes, I actually have a life). So my initial assumption was that StumbleUpon displays an article while enough people are liking it. To confirm this, I looked at 30 articles and noted down the number of likes and visits they had at 9am vs 9pm. If I saw a substantial increase in the number of visits at 9pm, it meant that StumbleUpon is still displaying the article to a lot of users. I was hoping to see a correlation between the links-to-visits ratio and whether an article was still getting traffic from StumbleUpon. Unfortunately, StumbleUpon makes it impossible to gather enough data, as it insists on displaying random stuff and I don’t have a whole week to do this. 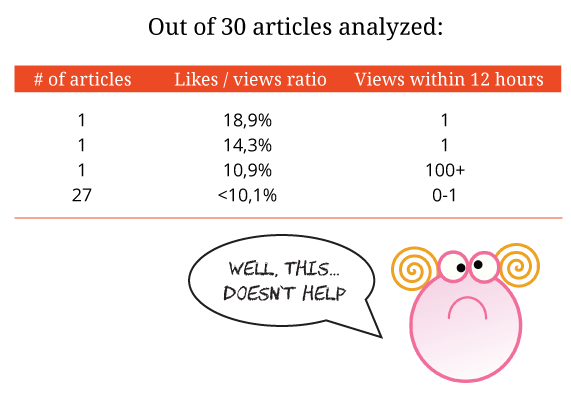 Among the 30 articles, I got only 3 articles with a likes-to-views ratio over 10%. 2 out of 3 of them weren’t being displayed anymore. But fun fact: StumbleUpon stopped showing the viewers all of the articles with the likes-to-views ratio below 10% (27 out of 30). It does look like that the articles that not many people like stop getting traffic, we just don’t know the exact number. So it’s important that your article gets an initial boost of likes and keeps a high likes-to-views ratio. I was lucky enough for it to happen by itself but if I did it again I would team up with a couple of friends and ask them to “like” it. Is it 100% fair game? It’s important that you keep a close look on things in the first couple of hours. Check your heatmap and session recordings. How far do the users scroll? Where do they click? Are all images displayed correctly? 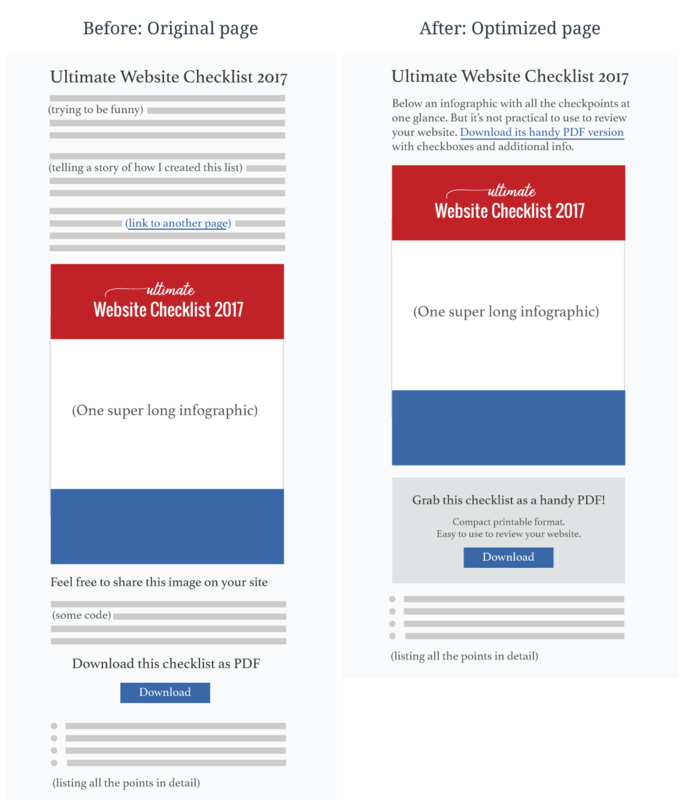 If you see users leaving the page too soon or not clicking on your call-to-action buttons, think about what could be the case and update the page. Make sure to delete the existing heatmap after you update the page and create a new heatmap, as the design of your page has changed and you won’t be able to see the correct data if you keep using the old heatmap. Watching your users interact with the page will also help you discover broken links and problems with your page on different devices and browsers. For example, I discovered that one of my call-to-action links was broken (#facepalm) and that one image wasn’t properly rendering for iPhones. Well, I didn’t see the problem at that time, but I noticed that initially, I was getting hundreds of views but only a few subscribers. I looked at my heatmap and session recordings and saw that a lot of people won’t scrolling far enough to see the infographic. I cut out the long story in the beginning and told people what to expect from the page with as few words as possible. I placed the infographic higher on the page making part of it visible above the fold. I removed the “add this image to your website” code snippet I had after the infographic and left only one call to action: The “Download” button. I added a line that explained why the PDF you could download is better than the infographic. I added a gray background to make call to action visually prominent. Original page vs optimized page. Click here to see it live on the blog. I started getting more subscribers and was able to keep the momentum for 3 weeks. But most importantly, I now get more subscribers organically, because this page ranks in search (which has nothing to do with StumbleUpon) and is now better optimized for conversions (as the result of this StumbleUpon exercise). Not bad for a couple of hours of effort, I’d say. Grab this post as PDF to have these instructions handy! Make sure your page delivers exceptional value and is optimized for StumbleUpon users. Install a heat map software on your website and get everything in place to get the heat maps and the session recordings for your page. Submit the page to StumbleUpon. If it was already submitted once, do that trick with a duplicated page under a different URL marking it no-index no-follow. Watch your stats and the session recordings closely. Notice how far the users scroll and where they click. Make sure everything is working as intended. If not, update the page and recreate the heat maps. This was the best and most informative blog post I’ve seen regarding StumbleUpon! Thank you so much! Most articles I was coming across were really old as well, and I was hoping to find something current. I recently got on StumbleUpon and am trying to see if I can get users to convert. This was the exact type of article I wanted to read. Is having lots of followers necessary on StumbleUpon? I can’t quite figure out how to find people to follow just yet. No… and yes 🙂 I managed to do all of this with my very first StumbleUpon share and zero followers. But in this case, StumbleUpon will be showing your post to people who specified some category in their interests – something only generally connected to the focus of your blog. That’s why I saw many people quickly bouncing off. So, if you want better targeted traffic to your website (people who are more interested in what you post about) so that you can get more subscribers you would need to build a targeted audience (like on any other social network). Basically, it’s better when you have followers that are interested in your specific topic.